Street designs will need to undergo more “holistic” change in order to accommodate growing needs for both curb and travel space for ride-hailing service vehicles, transit buses, bicycles, scooters, and pedestrians alongside traditional car and truck volumes. 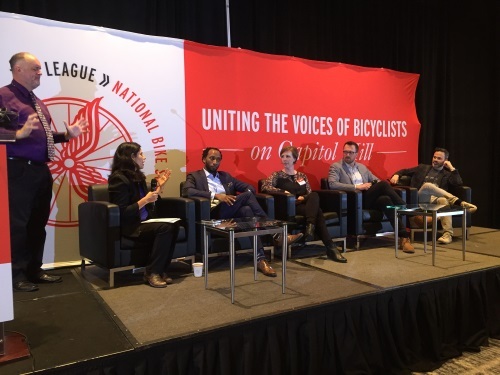 That was the outlook provided by a group of diverse panelists at the National Bike Summit 2019 on March 11, held in Crystal City, VA.
Rebecca Serna, executive director of the Atlanta Bicycle Coalition, highlighted the tremendous growth being witnessed for what she called “lighter, smaller, slower, sustainable vehicles” such as electric bicycles and scooters, which should spur the development of what she described as “Lit Lanes” dedicated solely to such traffic. “The multiplicity of micro-mobility modes offers a huge opportunity,” Serna said. Gabe Klein, a partner with Cityfi and the former commissioner of the Chicago Department of Transportation and director of the District Department of Transportation, noted that the growing plethora of mobility options means “we can no longer be purists” regarding specific modes of travel. Gabe stressed that “bridging the physical, economic, and cultural gaps around new modes” will be the “unique challenge” transportation providers at the federal, state, and local level will need to address in the future.